On the right side of the Village14 site ads for various products pop up. V14 has nothing to do with the ads. the tech folks who host the site for us use some 3rd party ad serving service. I have no idea of the logic and rules of who gets served what ads but somebody’s got my number. It’s the perfect attire for a committed carnivore like myself. 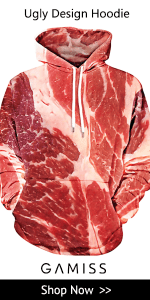 If any of you are racking your brains over what to get your favorite blogger for Christmas this year, you can’t go wrong with a “Meat Hoodie” for Jerry. Having read many of your posts here on v14, I can say your compassion for fellow humans is admirable. May you one day be able to extend the same compassion to all beings, including those you use to satisfy your carnivorous commitment. @Newtoner – These are nice too … but it’s just not the same. Jerry, there is so much inter-species cruelty in your comments this evening. you spoke of watching movies starring pancakes, and then shamelessly eating them. I have been vegetarian for 26 years, yet the meat hoodie pops up consistently for me on V14 and other sites! My second favorite is the hairy man chest and back. I REFUSE to click on these ads for fear of what will follow my internet history and ad preferences, but I am truly interested: what is the cost of one of these babies? They would make for truly horrific/awesome gifts. @ANP: This jacket is most likely the remains of a dairy cow, so lacto-vegetarians could still be potential clients. @Newtoner – I guess I’m still in the running for the meat hoodie, then (you can’t separate me and my cheese! )… Still not clicking on the ad, though. Even if it will provide revenue to V14. @ANP: I can see why you find a steak more disturbing than a piece of cheese. I share that feeling. However, your cheese is causing cows to suffer a heck of a lot more than Jerry’s meat. You are not doing animals any favor by replacing meat with dairy (or eggs for that matter). P.S: I also started getting those ads. The bot making advertising decisions here should be fired.